At the height of the PC revolution, the PC industry sold about 350 million PC’s a year. Those days are long gone, and unit sales of PC’s have declined ever since. But during the last 18 months, we have seen a slight uptick in PC demand, mainly from buyers looking for mid to higher priced laptops and Desktops. Some key industry players did not see this new demand coming, and in the case of Intel, they do not have the amount of mid to high-end processors available to meet the demand of some of their OEM’s this quarter. While demand is slightly up, don’t be fooled by this uptick. 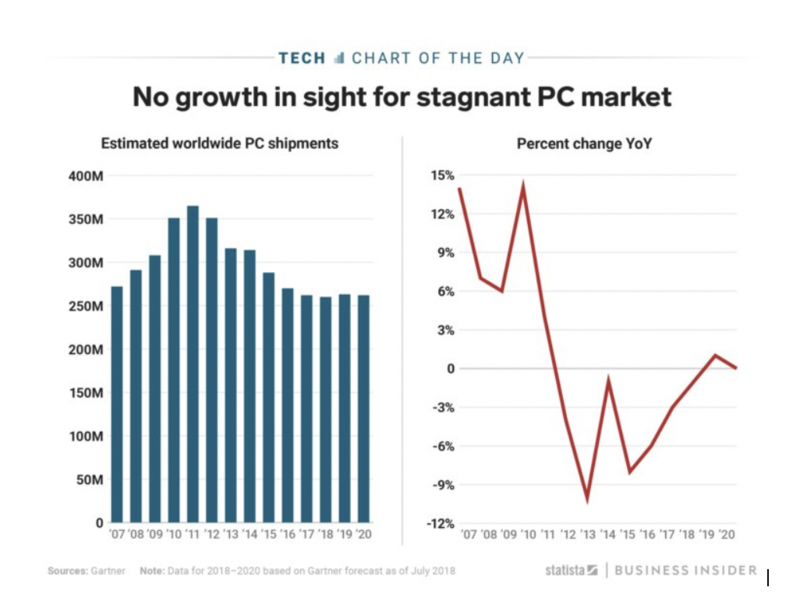 Demand for PC’s continues to decline and will never really grow again and be as robust as it was a decade ago. The chart below lays out the dim prospects facing the traditional PC market and shows by 2020 we will barely be selling 250 million PCs annually. There are many reasons for the decline in PC demand, but two products appear to have had the most significant impact on many people, especially consumers. Until the introduction of the smartphone, a PC was the only way people could gain access to the Internet, web browsers, email and any other type of digital material or apps they wanted to access and interact with digital content. And with the introduction of the iPad, the PC experience got even more portable. It does not mean that demand for PC’s will ever stop completely. Indeed, it is still the most important productivity tool for business users and many consumers. But the smartphone and tablet can do about 70% of what a person can do on a laptop or PC in more portable settings, and these are becoming the most used personal computers people use every day of their lives. What we are seeing is a lot of people using their PC’s for what we call “heavy computing” for creation, serious productivity and apps that want more horsepower and need a full blown PC or laptop to do specific tasks. A lot of people in business and some high-end consumers still need PC’s and laptops for the kind of job they do either daily or as the case with consumers, and whenever they need to do a task or project that requires more capabilities, then the can get with a tablet or a smartphone. That is why, especially in the business sector, we are seeing a bit more of demand in mid to high-end laptops and computers and are willing to pay more for quality, speed, durability and with the goal of keeping them 4 to 5 years. High-end consumer demand somewhat tracks this same approach to buying more expensive laptops and PC’s, expecting to keep them for 4 to 5 years too. But some of the OEM’s realize that users in business and consumer markets are using their smartphone more and more for productivity and see some of the new tablets, like Apple’s new 12.9” iPad Pro, even encroaching on laptop buyers who want performance but more portability. I have talked to one major OEM who is thrilled that PC demand is slightly rising now, but their forecasters believe that within the next 2-3 years, we may be lucky if the PC Industry sells 225 million PCs by then. But there is one buying group in the wings that are becoming a deep concern for traditional PC Vendors. That group is often called early Gen Z and ranges in ages between 14-18. If you have a kid in this age range, you already know that the smartphone is the center of their PC lifestyle. These kids are highly tech literate and have even found out ways to be productive using just their smartphones. While some of these kids have been using Chromebooks in their schools, others have used mainly iPad’s and tablets. But their primary computing tool is a smartphone. Even more important is their mastery of these smaller screen’s and its user interfaces. My two granddaughters school only uses iPads. They do all of their work assignment just on an iPad. I watched the kids in their school using the iPad to do their homework, read their textbooks, do presentations and fundamentally use it as their primary computing tool. Interestingly, in this case, since the iPhone mostly maps an iPad regarding UI and capability, some even do a part of their homework assignments on an iPhone. With this in mind, I was privy to some early research on this issue with the goal of trying to find out what form factor this age group would likely demand when they enter the workforce. While the early research on this suggested they would not be opposed to using some form of a laptop, their preferred form factor is tending towards some tablet with keyboard design. It turns out, growing up using their smartphones as their most personal computer is influencing the type of computer they will want to use when they start their work careers. Microsoft kicked off this concept with their original Surface tablet/keyboard product some years ago, and it turns out that the core buyers of this type of Surface computer are mostly people in millennial age ranges. Recently, Apple took a bold step to position their new 12.9 inch iPad as a potential laptop replacement. And we hear from ODM’s that at least two large laptop vendors have been asking for more Tablet Focused devices with built-in keyboards too. While these 14-18 years olds are very smartphone-centric, I am sure you have seen kids as early as ten years old getting smartphones too. This entire generation will grow up using smartphones as their primary computer since it is the device they spend the most time with and use it for both consumption and various forms of productivity such as email, texting, and research. PC vendors who only focus on laptops and even 2 in 1’s need to do more research on the younger Gen Z audience and study closely how they use their smartphones as their primary computer. My guess is that by the time they enter the workforce, traditional notebook designs will be their parent’s computer and they will want to use something very different than what is offered to most in the workforce today.